This summer is the year of fruit. One crop of fruit goes banging into the next. My fingers are hopelessly purple after spending a weekend up to my elbows in Methley Plums Cherries, gooseberries, currants have come and gone and our previously most ungenerous plum has produced a bounty of fruit. Sam Benowitz of Raintree Nursery in Washington, saw this early plum was forced into bloom for the Seattle Northwest Flower & Garden Show several years ago when NW Garden Writers Assoc. members and Pierce County WA Master Gardeners teamed up to construct a food garden promoting the GWA “Plant A Row For The Hungry” program. We received a gold medal and The People’s Choice Cup”. It was time for me to retire from designing show gardens. When we dismantled the garden I purchased this plum tree from Sam and planted it in our home garden. While it has a lovely spring shower of blooms, in previous years the fruits have been small and sparse. This year we have a huge supply of medium sized Japanese plums. The fruits are a deep red, a delicious sweet tart flavor and a good size for eating out of hand. The pits are not freestone but can be cut in half and popped out with a paring knife. The deep colors must mean it’s full of anthocyanins and bioflavonoids. With this much fruit, I’ve had ample opportunity to experiment on how what to do with pecks of plums. These are recipes which we can wing it with the abundance of summer, so nothing precise, be careful with hot peppers, the heat can build. I’m not giving you my recipe for jam failure but it happened. 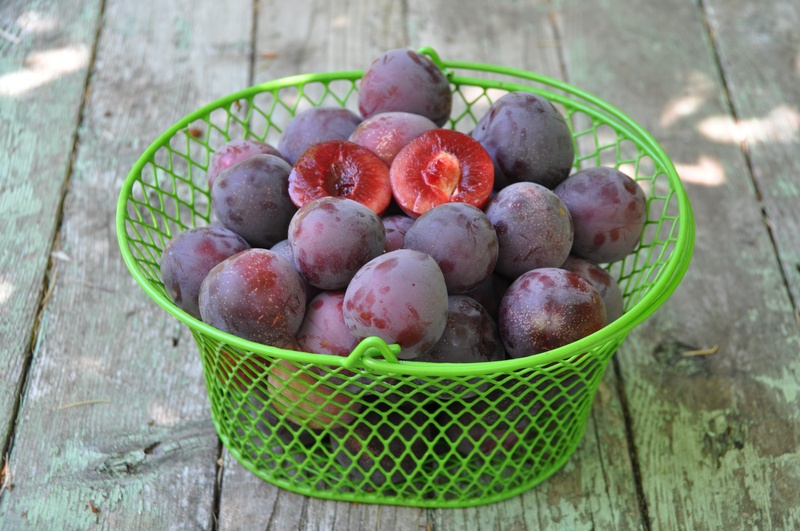 Eat your fill of these fresh plums. They’ll store for about two weeks in a refrigerator. Fresh Plum Salsa, chopped up plums, jalapenos, cilantro, a colorful bell pepper, onion, a little garlic, lime juice and salt. If you want to use a processor do it with a light touch. I prefer the chopped texture. Chipotle Plum Barbeque Sauce, 6 cups of pitted plums, 3 medium onions, t tablespoon chipotle chili powder & one tablespoon smoked paprika, or 2-3 chipotles in adobo sauce, 3 large cloves of garlic, minced, ½ cup cider vinegar sugar and salt to taste after cooking. Run these ingredients in a food processor or finely chop. Put in a heavy non-reactive pan and simmer until thickened. Give these an occasional stir and it’s good to be doing another kitchen task so you can make there is no scorching. Remove from heat, season with sugar and salt. When cool package some up in small containers and share. Plum Purple Basil Pie, Use any good pie recipe, I prefer those heavy on the fruit. Check out a peach pie recipe and simply substitute plums. The purple basil brings in a nice spicy flavor without little green specks but any basil can be used. A touch of cinnamon can be added. Plum Dessert Sauce three cups of halved or quartered plums, 1 cup red wine, 2 tablespoons lavender flavored a honey ( a gift that is too strong for toast but good in sauces and lemonade)…add more if you think best, ½ cup sugar, 4 crushed or freshly ground cardamom seeds and 1 teaspoon vanilla. A little cinnamon, a bay leaf, a few drops of almond flavoring or liquor are all possible additions. Prepare the plums while you bring other ingredients to a boil in a non-reactive pan, reduce liquid by about 1/3. Add plums and gently cook for three minutes. If sauce seems too thin for your liking pour off some of the juices, cool slightly and combine with 1 tablespoon cornstarch. Reheat until starch is cooked, it will be transparent. Excellent with pound cake, a scoop of ice cream or whipped cream. Homemade pound cake, good ice cream or real whipped cream recommended. If you have a good supply of plums give one of these recipe suggestions a try and don’t be hesitant to tweak to your taste. These should work with almost any plum variety. I see our crop from the Prunus Mume is maturing fast. Just rubbing one leaves a fragrance on my fingers but coming up with something besides salted ume’ plums may be a challenge but oh, to capture the fragrance when it’s not an eating plum. 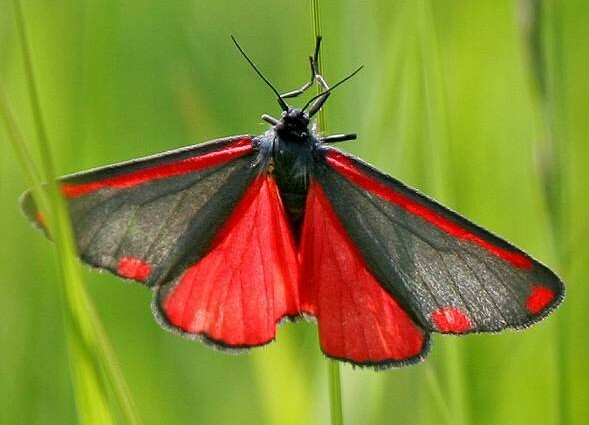 The predatory bugs, beetles and in this case the lovely Cinnabar moth are in full force in summer months. Before the Cinnabar Moth was introduced to control Tansy Ragwort, this plant was the bane of farmers with grazing cattle or horses. 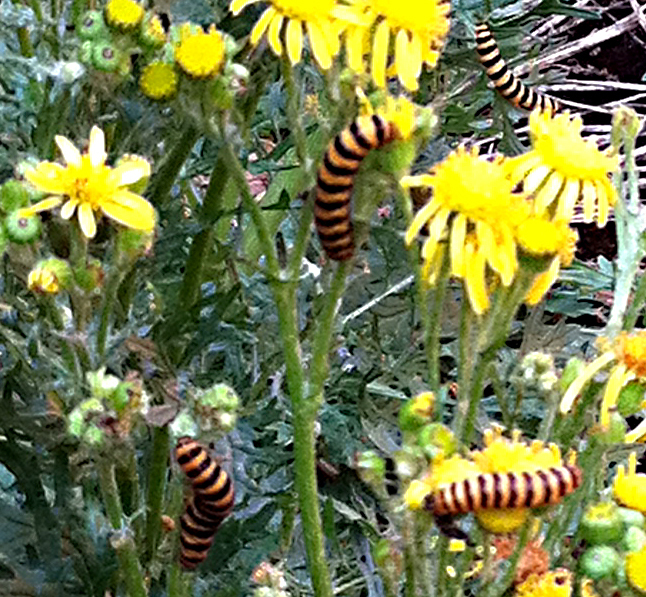 animals commonly died upon eating Tansy Ragwort. Sheep are curiously unaffected. This plant, a member of the Senecio family is highly toxic and grew with abandon throughout Western Oregon until the introduction of this moth by Oregon State University researchers in 1960. The moth is native to western Europe and parts of Asia. the moths seek our the tansy plants, lay eggs and in a few weeks their larval offspring are denuding the plants of flowers and foliage. It has proven a positive introduction to our region. Like all predators they don’t exterminate their source of food. We do notice a cycle of tansy showing up along the roadsides and the following year an increase in Cinnabar Moths.